The facility has hosted over 12 million patrons since its opening in 1986. It is home to the University of Miami Men's Basketball team as well as two professional franchises: the NBA Miami Heat and NHL Florida Panthers. The facility hosted the Stanley Cup Finals in 1996 and has served as host to numerous sporting events and record breaking concerts. (from Miami International Airport) Take 836 East to Biscayne Blvd. exit. Turn right at the light and proceed down Biscayne Blvd. to NW 8th Street. Turn right on NW 8th Street and proceed three blocks. The arena will be on the left. A Florida state judge has ruled that the Miami Sports and Exhibition Authority breached its management contract with Decoma Miami Associates and ordered the authority to pay the company $12 million. The ruling comes after the Authority gave $13 million in tourist tax money in 1997 to the city to help ease the $68 million deficit. Decoma says the money should have been used for arena maintenance and the judge agreed. 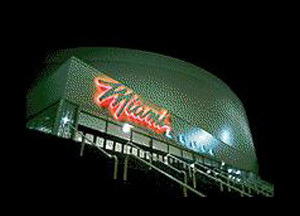 The venue opened in 1988 at a cost of $53 million and recently lost its major tenants, the Miami Heat and the Florida Panthers to new arenas.